I wonder where the family bonfires on cracker night, the aussie-hacienda style architecture and the olive green and burnt orange kitchen laminate have gone. I suspect relegated to the same place as the pineapple upside down cake and such things. I have a vivid memory of my aunt arriving at our house, wearing her cat-eye sunglasses andvspotted sundress, stepping delicately out of her Holden EH, Jackie O-style,clutching a Tupperware cake server. We knew what was in the cake server, the ultimate treat – the caramelised, sticky, pineapple upside down cake. 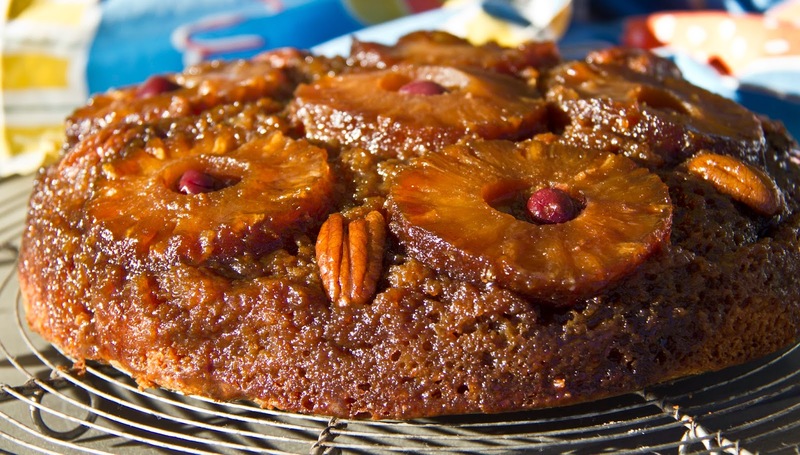 Like all good housewives of the day, she had stocked up on tins of pineapple rings to make this exotic delight. This cake is best left for a day for flavours to infuse. Prepare a twenty-three centimetre cake tin by adding the butter to the cake tin and placing inside the warming oven until melted, this should take a few minutes. Remove the tin from the oven and sprinkle the brown sugar evenly over the butter. Place six pineapple rings evenly over the sugar and place a cherry inside each pineapple ring. Fill the spaces between the rings with a pecan. Using a hand mixer, in a metal or glass bowl, beat the egg whites on high until peaked. Set aside. Using an electric stand mixer beat the egg yolks with the sugar at medium speed until light and creamy. Add the pineapple juice and vanilla extract and beat well. Add the flour mixture to the creamed butter mixture and beat together until well combined. Fold in the egg whites using a metal spoon or rubber spatula. Pour the cake mixture evenly over the fruit, and smooth off with a spatula. Bake the cake for thirty minutes, or until the cake is golden and a skewer inserted into the centre comes out clean. Place the cooked cake on a wire rack to cool for ten minutes. Run a blunt knife around the edge of the cake to loosen. Invert carefully onto a plate, as the juices will run out. Serve warm with cream or at room temperature. This cake improves with age. First published Canberra Times October 9 2013. The buzzing chorus of Sunday lawnmowers and the competing cicada crescendo leave you in no doubt that summer is just around the corner. Add to the din the sizzle of lunch grilling on the backyard barbeque, and Mum calling out from the kitchen for someone to check that the meat doesn’t burn, makes my Sunday complete. As the deliciously crisp offerings make their way to the table and the dog follows with his nose expectantly upturned, the unmistakeable aroma of sweet cooked pineapple floats in the air. 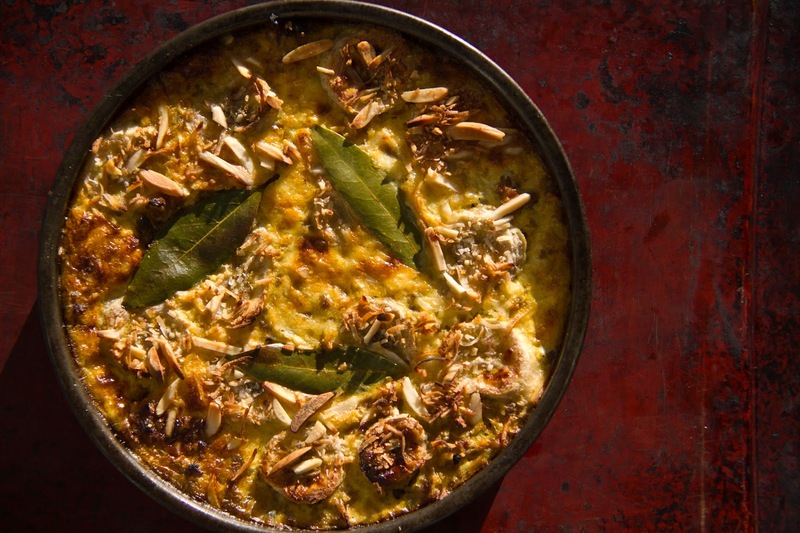 For those who love their pineapple cooked, this one is for you. The barbeque caramelises the sugars in this tropical delight, and makes a perfect partner to onion, basil and coconut. 2 medium red onions, sliced into thick rings, keeping them intact. Preheat the barbeque to a medium heat. Drizzle the pineapple slices and onion rings with the olive oil. Grill the pineapple and onion rings until golden and the grill marks appear on the softened flesh. This will take about five to six minutes each side. They should be lightly charred. Slice the pineapple into chunks and chop the onion rings, then combine in a serving bowl. Add the basil leaves, shallots and coconut before drizzling with lemon juice and a light sprinkle of lemon zest. Toss before serving warm or at room temperature. 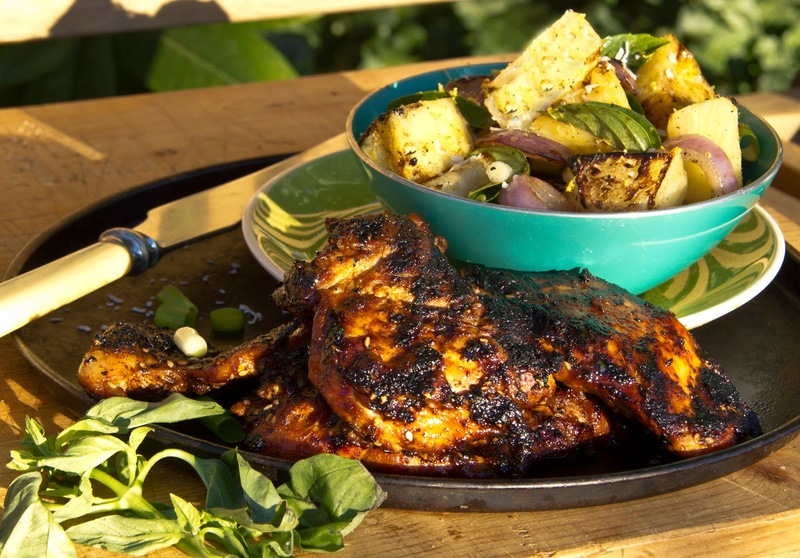 Setting the chicken aside, mix all of the marinade ingredients together, and pour into a resealable bag or large bowl. Place the chicken thighs in the bag, or bowl, seal the bag and rub to coat the chicken with the marinade. Leave for a few hours to infuse and massaging the chicken occasionally to distribute the marinade. Remove the chicken from the marinade, allowing the excess to drip off. Grill until the chicken has cooked about seven minutes per side, checking for doneness. Discard any remaining marinade. With nothing better to do than focus on the eating habits of the rich and famous, I find that there really are some weird culinary appetites out there. I wonder if being rich and famous causes this or is it an pre-existing enzyme in the brain that sets them on this path to culinary oddity? I am curious about Elvis Presley’s food habits; the widely known peanut butter and jelly sandwich binges and flying cross country to gorge on pre-ordered burgers. In researching this culinary curiosity, I was further surprised to stumble upon his obsession for pound cake. It’s said that he single-handedly consumed a whole loaf each time it was made for him by a childhood friend. This friendship persisted and she developed the recipe especially for Elvis, delivering the cooked cakes to him at Gracelands. She beefed up his version of the basic pound cake with extra cream, creating a smooth crumbed but heavier texture, to satisfy his food cravings that could strike at any time. I decide to “doctor” Elvis’ cake and create my version, adding bananas, ground cinnamon and ginger to the Elvis mixture and halved the cream. 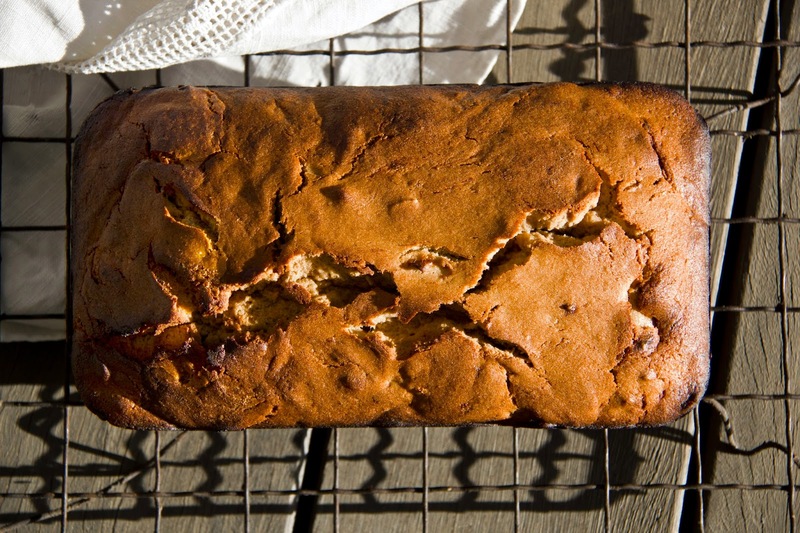 This makes a delicately flavoured banana pound loaf, moist and fudgy with a hint of spice. The quantity makes two loaves and one always ends up in the freezer for later. I like this old style cake in its unadorned state, pristine and warm from the oven, with maybe just a little butter. Alternatively, top with a sweet cream cheese and walnut icing. Grease two, twenty-three centimetre loaf pans and set aside. Beat the butter, sugar and vanilla with an electric mixer until pale and creamy. Add eggs one at the time, beating each one in well. Add the flour and the cream and milk mixture, alternately, beginning and ending with the flour. Add the spices and salt and beat until combined for about three minutes. Remove the bowl from the mixer and stir in the mashed banana and orange zest. Divide the cake batter between the two greased loaf tins and bake for thirty-five to forty minutes. Remove from the oven and leave for about fifteen minutes before removing from the tins.